Decocino offers products that are designed to meet the latest baking trends. Whether you’re an amateur or a pro – Decocino means that anyone can decorate baked goods like a star baker! A hallmark of the Decocino brand is the availability of licensed products featuring characters from Star Wars and other popular Disney/Pixar, DreamWorks, Marvel and Mattel movie productions. 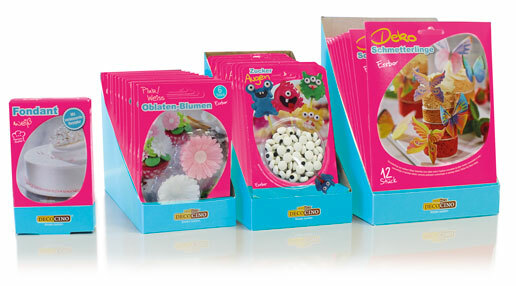 Also included in the Decocino range of around 120 products: sugar paste, gum paste, edible coloured pastes, DecoChoc chocolate-based sugar modelling material, sugar sprinkles and decoration in a range of colours and styles, as well as striking wafer and edible paper for cake and muffin decorations. Cats and dogs are the most popular pets; however, for most people, a pet is far more than just an animal. Animals accompany their owners wherever they go and understand their concerns better than many people. They receive delicious food and fun toys, as well as regular visits to the vet. Above all, they are full members of the family. Cabioke organic sugar paste means that even nutrition-conscious baking enthusiasts can make their creative baking ideas a reality. Cabioke organic sugar paste is ready to use and is free from palm oil and lactose. It is manufactured from certified, organically grown products in accordance with DE-ÖKO 022. Cabioke organic sugar paste impresses with its high quality standards and elasticity, which means that it resists tearing and adapts its shape to fit any cake exactly.